Alfredo, one of the classical Italian sauces, provides a creamy rich texture and often tops delightfully gummy Fettuccine noodles. Many dishes such as these leave the body feeling over fed and under nourished as the calorie content exceeds requirements and the nutrient content is deficient. By manipulating the ingredients this unbalanced meal can be shifted in favor of a low calorie and healthy option. The main star of this re-balancing act is cauliflower. This crusiferious vegetable offers a forest of phytonutrients with next to no calories. Using spices not only leads to different notes of flavor they also contain many unique disease fighting properties. The addition of nutmeg in this sauce adds a layer of flavor that offers warmth and bioactive phytochemicals unique to this spice. This recipe can be adjusted based on your taste preferences or what you have on hand. For instance, any combination of cheese can be used as long as it equals one cup. It is also possible to steam the cauliflower instead of roasting it. Roasting vegetables is less destructive then frying or boiling and gives a desirable caramelized flavor. However, steamed vegetables seem to retain more of their nutrients when cooked using this method. Choose the method that best suits your needs. Either way, the end product will be a guiltless Alfredo sauce that you can top zucchini noodles, spaghetti squash or a hearty whole grain. If you are unfamiliar with these pasta alternatives visit the Past Alternative links found on the Rx meals page under the Farmacy tab. Information on whole grains can be found on the Whole Grain Description page also under the Farmacy tab. Serve with shrimp, chicken and other vegetables to increase protein and other disease fighting nutrients. Directions: Preheat the oven to 400 degrees. Cut the cauliflower head in half. Store one half in the refrigerator. With the other half begin to cut the florets from the stem. Line a baking sheet with tinfoil and spread the florets on the sheet evenly. Drizzle the oil and sprinkle salt and pepper over the cauliflower. Toss to combined. Place the 2 garlic cloves on the baking sheet as well. When the oven has reached temperature place the sheet pan inside and bake for 20 minutes or until the florets are fork tender. In the blender combined all the ingredients including the roasted garlic and cauliflower. Blend together until a homogeneous mixture is reached. In a sauce pan heat the blended sauce on medium. Stir continuously while the Alfredo begins to bubble. Cook for several minutes to allow the corn starch to thicken the sauce and the cheese to melt completely. 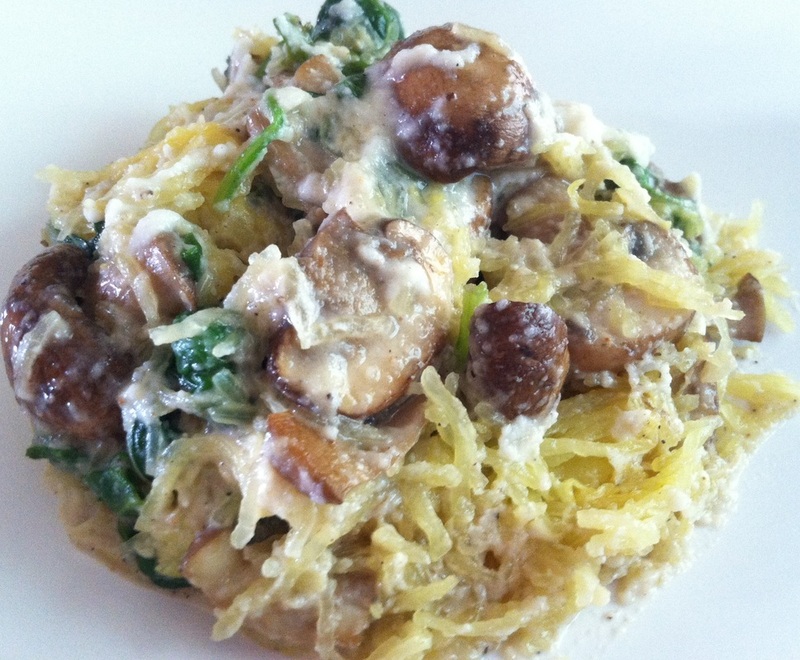 Pour onto zucchini noodles, spaghetti squash or a whole grain.